Nikoi Island is a virtual paradise. Located off the coast of Bintan Island in Indonesia, the private island is home to a single hotel. The island itself is pretty small and doesn’t take more than 30 minutes to walk all around it. Getting to Nikoi Island is a small adventure in itself. It is pretty easy to get there but it does require a little homework so that you aren’t completely lost and wondering what is going on. While you don’t need any information on what to do, for some, including myself, it is important to know exactly what is going on. From your hotel in Singapore to Nikoi Island, it shouldn’t take more than 5 hours to get there, but if you time it right it should take only 4 hours. For some, it will be a boring and tedious trip, but for me, my first time in Indonesia, it was an interesting adventure in itself. The first thing I did to go to Nikoi Island was to grab a taxi to Tanah Merah ferry terminal which is located next to Changi Airport. I left pretty early and had nothing to do for about 1.5 hours. It went quickly enough as I had a few things to do at the terminal. I was able to check in, get my bags loaded, have a coffee and also get my documentation done for immigration in Indonesia before boarding the boat. 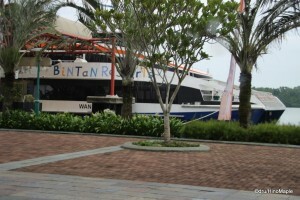 The boat is a catamaran and takes about 1 hour to get to Bintan Island. 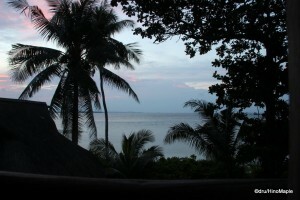 Bintan is a famous resort area next to Singapore, but located in Indonesia. 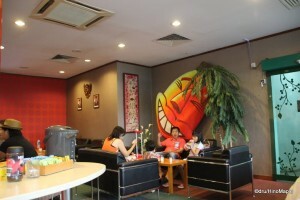 Most passengers will go to Bintan resorts, but on my particular ferry, there were a total of 8 people heading to Nikoi. 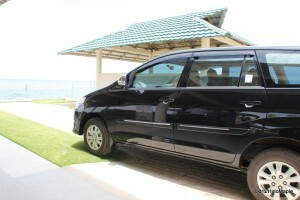 Once at Bintan, you are well taken care of. As you disembark and head towards the processing centre, you will see someone holding a sign that says Nikoi Island. This person will check your name and confirm a little information regarding who you are. They will then take your passport and any other relevant documentation and have you wait near the luggage area. The transfer staff member then gets your documents processed and once you are all stamped, they get your baggage receipt where you then wait in the lounge for your bags and the car to be ready. It doesn’t take long and soon enough you are waiting outside with your bags. 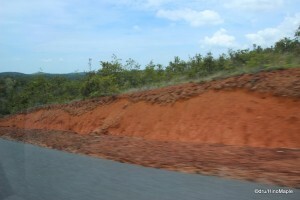 You are placed in your own car and taken on a 1 hour drive across the island. The drive across the island is pretty good. You start off in the segregated resort area but soon enough you are into the real Indonesia. 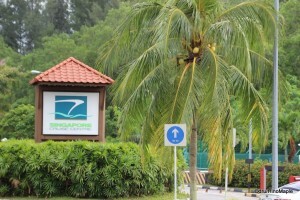 The Bintan Resort area is a segregated area like Club Med. You are basically in a nice area with very little to see in the way of real local culture. On the drive across the island, you don’t get to interact with the locals but you definitely get a taste and look at what the locals are like. It is a typical rural developing country from what I can gather and it was very colourful, literally. The homes and businesses I saw were often painted in very bright colours from pink to yellow. Many homes looked more or less like a wooden shack, but kept well enough that people could live comfortably in their style of life. The 1 hour drive can feel a little long if you have travelled that way before but for my first time, I was trying to absorb as much of Indonesia as possible. I found the homes to be very lovely for what they were and the number of mosques and schools actually surprised me. Every 5 or 10 minutes we would pass a school. At roughly the same interval we would pass what seemed to be a mosque. Due to the timing, we were able to pass a couple of mosques during the prayer time and I was able to hear parts of the prayer at two different mosques. Needless to say, the driver was driving at a good speed but not so fast that you would feel uncomfortable. 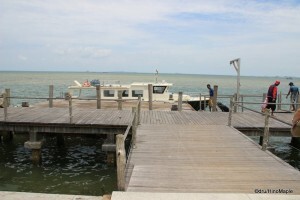 Within the hour we arrived at the small port after seeing a few villages; the hillside; and the coasts of Bintan Island. After a drive across Bintan Island, you then confirm your information with the staff at the port and they make sure your bags are tagged and prepared for the journey to Nikoi Island. 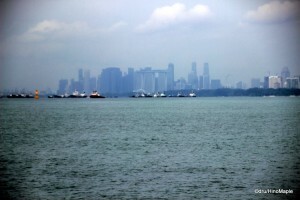 From Bintan, the ferry trip is only 15 minutes. The port area is covered and most of the passengers travel in a caravan to the port. Once everyone is there, you are ferried over to Nikoi Island. You are then greeted by the people who walk you from the pier to a bar, the Beach Bar, where you check-in. On the way to the bar, I brought up the rear and had a little chat with one of the guides who told me a little about the island and some of the things I can do. Once at the bar, I was helped by a very cute little girl who couldn’t have been more than 14 years old. I’m sure Ru would be gushing over her and trying to take a million pictures with her. I was too busy loving the island to ask for her picture but she left a great impression on me. The other workers were helping her a little, as it seemed that she was new to the check-in process. You have to hand in a lot of information such as your hotel booking confirmation as well as information regarding your return ferry to Singapore. She went over all of the amenities available to us as well as the meal schedule. She kept mixing up all of the meal names so I had a fun time correcting her. She seemed a little embarrassed but I had no problem with it, and I felt like I was teaching a little. Considering it had been a few days since I was last teaching, it was a little fun to do it again. During the check-in process, we were served a complimentary juice made of watermelon, pineapple, and oranges. It was delicious to say the least. Once everything was done, we elected to head to our cottage where the cute girl proceeded to show us around and told us what to do as the light switches could be difficult for first timers. 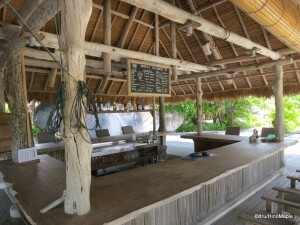 Once all of that is done, it is time to enjoy oneself on this lovely island. There really isn’t much to do except enjoy nature. I didn’t do too much but I had a lovely time tanning, swimming in the ocean, technically the South China Sea, and lounging about in my cottage. I even had time to write a few blog posts. When you don’t have much time for anything, it really is great to get away to a place where there really isn’t a good way to be connected to the real world. Having internet for only 30 minutes at a time is really hard at first but you get by. Enjoying life without the worries of work, news, or anything else is wonderful. At the time I was in Nikoi Island, the problems of Syria and their chemical weapons were finally starting to be resolved, a typhoon just hit Japan, and Fukushima was starting to simmer again. Who needs any of that when you can just enjoy this view! This entry was posted in East Asia, Travel and tagged Asia, Bintan, Bintan Island, Bintan Resort Ferry, Bintan Resorts Ferry, Changi, Indonesia, Nikoi, Nikoi Island, Resort, Singapore, South-East Asia, Tanah Merah, Tanah Merah Ferry Terminal, VIP by Dru. Bookmark the permalink. I read the “getting off” post before I read this “getting on” post. I think once I get on this island, I’d never want to get off again. Provided … does Amazon deliver?! Yes, it is hard to get off the island, but they do make sure you get off. Just without the gun or machete. Amazon? Don’t think so unless Kindle counts. Hello I enjoyed your post after researching for Nikoi. Can I just check with you if you had to pay S$90+ for the transfer from Bintan Ferry Terminal to Nikoi? Hello, thanks for the comment and the nice words! Yes, I had to pay 90SGD for the transfer from BFT to Nikoi and back again. You have to pay it when you checkout. I think the price is including taxes and such. I’m sorry, I don’t have my receipt anymore.